Coolers with wheels are easier to move from place to place. 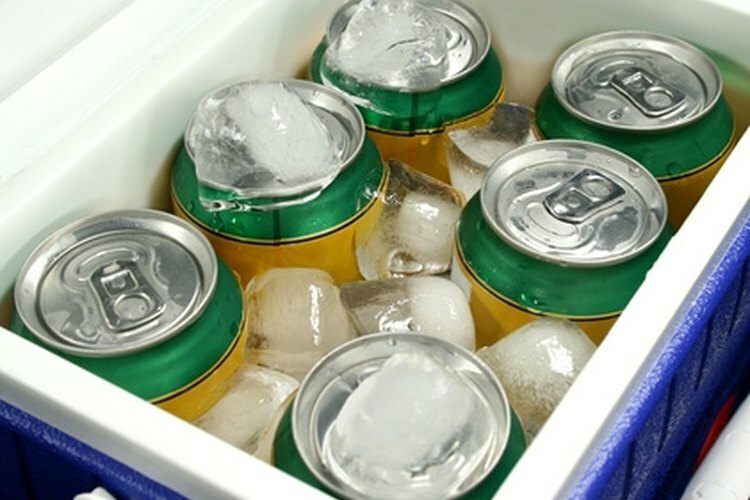 Coolers frequently have to be moved from place to place, be it from the back of the car to a picnic area, or from the inside to the outside of the house. If you need to move the cool farther away, it is more efficient to move a cooler with wheels so that you do not strain yourself trying to carry 40 gallons of ice and liquid. Rather than replacing your old cooler with a one that has wheels, buy a few hardware items and make your own cooler wheels. Decide where you want to install wheels on the bottom corner of the cooler. Make sure this location does not impede the cooler holding area, or you will cause the cooler to leak both water and cool air. Drill these holes about 1-inch deep with a power drill. Take each of your 3-inch steel bolts and put the other items on it in this order: a 1-and-1/2-inch steel washer, a plastic or rubber cooler wheel purchased from a cooler repair part distributor, another 1-and-1/2-inch steel washer and a small rubber stopper used to hold the parts tightly in place. Fill each of the holes you have drilled with glue or heavy-duty plumber's putty. Then insert the steel bolts with these items attached into these holes. Put two heavy objects, like cinder blocks, flush on each side of these new tires while the glue or putty dries within the plastic cooler holes. Leave in place for at least two to three hours. After the glue has dried around each of the long steel bolts, consider heating up the plastic so that it melts slightly and bonds more firmly around the steel bolt and the glue or putty you used. Rubber wheels last longer than plastic wheels and put less strain on your homemade steel bolt axles. Replacement parts on coolers are only meant to work on the coolers they were originally designed for, so keep this in mind when purchasing them. Make sure the tire you are installing does not rub or become jammed against the outside of the cooler. Measure this before installing, if possible.